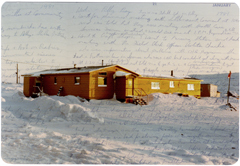 Part 2 of the Arctic Crisis Project: c. 2008/09. 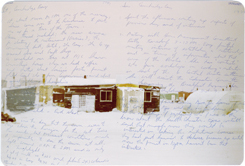 In this series, using photomontage, the insertion of hand written journal notes written on the day the photograph was taken in January/February 1981, references the different orders of memory sources that weave together the intersection of personal and public narrative. The natural twilight of early winter, combined with the intimatel touch of my handwriting, creates a visual poetic that references fragility, loss and the simultaneity of past, present and future. 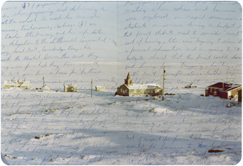 Content of spidery handwiting fade in-and-out of the lanscape structure, just as memory, snatches of recognizable information being simultaneously personal and public record. 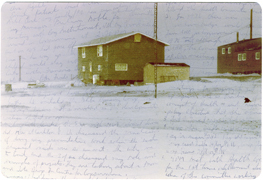 The repositioning of photographic images and writings across personal and public historical time into an aesthetic investigation of memory, perception and consciousness contributes to contemporary visual art discourse on human identity and how we see ourselves in space. 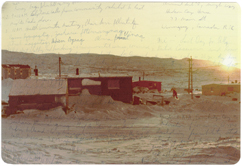 While the title of this project references the Arctic, the operative word is “Crisis”. The underlying aesthetic and socio-environmental concerns within this project are consistent with research using other medium in my practice such as, painting, photography, video, installation and performance art. ©2013 Sandra Hawkins. All images of visual and media artworks, articles and poetry by the artist shown on this site are fully protected by copyright law. They are not to be exhibited, reproduced, displayed in any digital format, or placed on any web site without the express written authorization of Sandra Hawkins.